Understanding the increase of cost in higher education over the past twenty years is a complex issue for many reasons. To learn about the higher education system, I am reading Higher Education in America by Derek Bok. This book answers many questions swirling around about our higher education system. Why are costs escalating so quickly? Are there fundamental problems with the system? Do graduates have the necessary skills and knowledge to enter the workforce? In this blog, I discuss issues related to the cost of higher education based on Mr. Bok’s expert analysis. First and foremost, there are many factors in the cost of higher education. The cost equation is not only paying professor salaries and giving them tenures (a target of many critics), but also managing administration costs that have risen more sharply than any of the other factors, providing a good quality of living for students who live on or near campus, and funding athletic programs (that in most cases lose money). Second, the higher education system has thousands of players that compete on various levels. 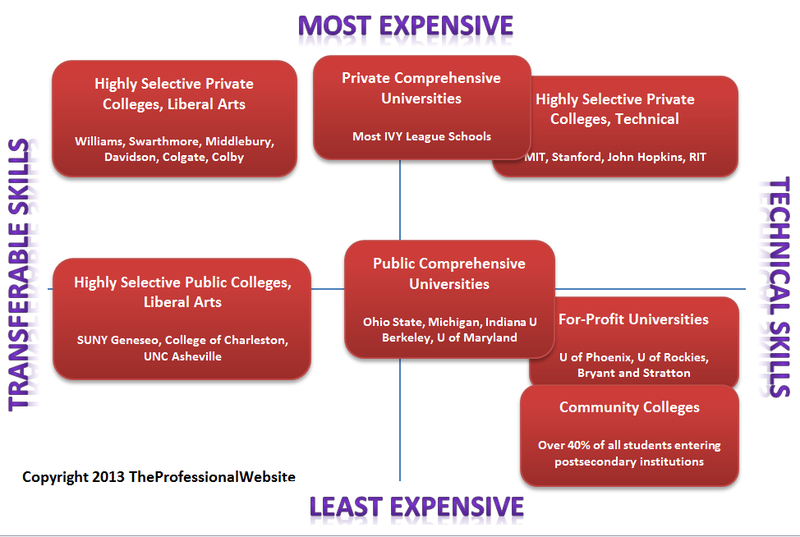 It does not make sense to compare costs across the board as if all colleges and universities market themselves the same way. Mr. Bok compares the higher education market to the auto market (page 112). Some consumers shop on lowest cost, some on the best value, some on quality, and some on the whole package (including all the bells and whistles). For example, a cost conscious consumer considers a community college, in-state public colleges, or a college with the best financial aid package while a whole package consumer considers colleges that offer the best experience – a decision that might come down to the quality of food in the dining halls or how modern their workout facilities are. Obviously, how colleges and universities perceive the need to cut costs varies considerably. Third, online learning channels are gaining in popularity and may be a way to lower costs; however, it is too early to assess their efficiency. Some higher education institutions do not want to take away from the on campus experience, so have introduced online classes where the instruction is online but you complete the homework and assignments in a classroom. As far as higher education institutions reaching a larger off campus audience, online courses might fray per student instruction cost (though as mentioned above, there are other bigger cost factors). Fourth, for profit institutions are able to charge a lower tuition and more of their students qualify for financial aid. However, the quality of education is being scrutinized regarding job placement and high dropout rates – only 22% of students graduate within 6 years (page 104). Fifth, public colleges and universities receive subsidies from the state to support the community. This lowers the cost for in-state students, and often gives states influence in decisions made by the college. Alternatively, private institutions have little meddling of their affairs by state governments. Sixth, some institutions receive funding for research and development from state and/or federal government. This can be a huge stimulus for developing cutting edge technologies, getting students employed after graduation, and stimulating the surrounding community. For example, SUNY Albany is receiving significant aid to build an infrastructure for nanotechnology – something expected to transform all of upstate New York. Whether it is reflected in the cost of education, investment in research and development has future payoffs. Finally, the US higher education system is the best in the world. So as you try to fix cost problems, you do not want to disrupt something that already works in many ways. For most, choosing the right higher education is a crucial consideration during the planning and building stages of a skills-based approach. After graduating from high school, professionals’ primary focus in life is building skills necessary for their career. They commit to building a combination of transferable and technical skills – a skill set – so they are prepared to enter the workforce or continue on to a graduate level education. Investment in higher education is often on par with buying a house (likewise, the accumulation of debt). There are a growing number of learning channels that offer cheaper ways to build skills, such as MOOCs, online badges, and apprenticeships and they might work for some professionals, but they do not have the holistic benefit of a traditional college experience. Most Americans aspire to obtain a college degree, which Obama backs up with his initiative to raise the number of Americans with some sort of college degree to 60 percent by 2020 (page 89). Derek Bok (2O13). Higher Education in America. Princeton: Princeton University Press.